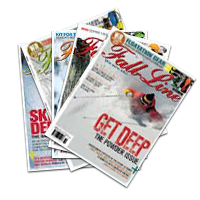 » Telemark Technique Tips » How to Carve on Telemark Skis»October 2013. First up: it’s carving, it’s an awesome feeling setting the skis on edge and letting them take you round the arc. Like a banked corner on a roller coaster, the faster you go the more gravity defying angles you get and the bigger the grin on your face. Despite the radical improvements in telemark ski equipment today, a truly carved turn is still quite difficult to do. Telemark skiers can get just as much out their skis as our alpine brothers, it’s just a bit more technical. The key to a carved turn is minimising your movements, less is definitely more. Timing and accuracy are also critical, it's all about using your body to influence the skis at the right time and in the right place to make the skis do the work. Get it right and you’ll stick anything, even sheet ice. Open your feet and ski with a wide stance - this gives you stability at high speed, a greater range of movement when separating and helps you maintain pressure on the outside ski. The Lead change. This is the telemark skier’s transition when the front ski becomes the back ski, and visa versa. Make a smooth lead change (while changing edges) at the top of the arc. In general we match the rate and range of your lead change to the arc length and your speed. My mantra is 'Speed Masks Performance', a slow controlled lead change ensures good balance, timing and pressure control on both skis. Although a carving turn is performed at high speed, it's not necessary to make sharp snappy lead changes - save them for the bumps! Less is Definitely More - Edge Change Before Turning Anything! Less is definitely more and economising or minimising movements is probably our biggest challenge when making carved telemark turns. Watch any truly great skier and they look so effortless, and that's the secret, what they're doing is effortless. Edge change with minimal input, simply roll your ankles from the uphill side to the downhill side without making any rotary movements. The skis should take you round the corner, you've paid lots of money for them, so relax and let them do the work. Above the fall line maintain an aligned body position by simply making sure your body is stacked vertically over both feet. You'll know you've got it right when your skis stick even on sheet ice, let your body incline inside the arc but not too much otherwise you'll lose pressure on the outside ski. Be patient and 'Love the Fall Line', don't rush it… enjoy that moment when you're facing straight down the hill, skis tilted. Then let them arc back underneath you as they cross the fall line. If you can feel the skis rebound under your body then your timing and body position were spot on. As you let the skis cross back underneath you, separate your upper and lower body to control pressure on the outside ski and set up your body's movement into the next turn. At the end of the turn see how the shoulder level stays horizontal while the legs are at an angle.